The imperial geological survey plan. Source: WIG map archive. As the 19th century progressed, the Austrian Empire’s engineers and scientists advanced their cartographic repertoire in many ways; the geological map presented here is a colorful example. Part of a massive effort spanning the entire Empire in almost 500 detailed maps at 1:75,000 scale; the geologists divided the Empire into four political sections for separate study, of which Galicia was the northeast section. The plan for Galicia. Source: WIG map archive. 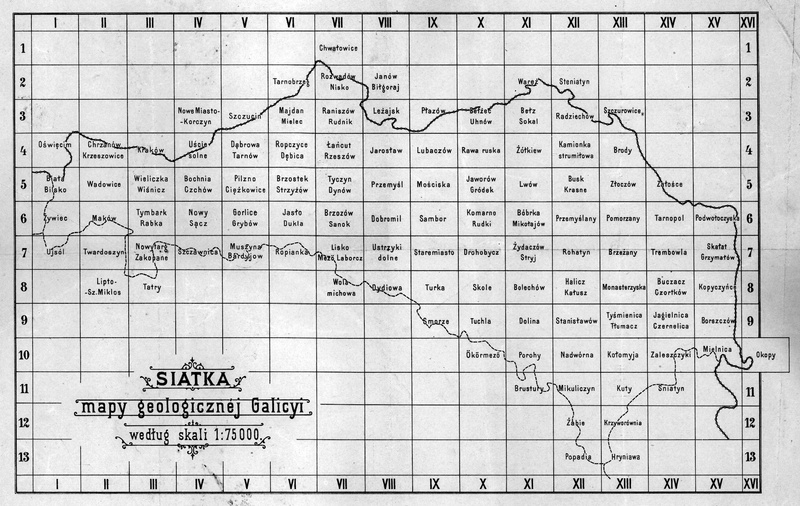 The resulting Atlas geologiczny Galicyi (Geological Atlas of Galicia) was developed from 1884 to 1911 in several editions, published by the Fizyjograficznej Akademii Umiejętności (Physiographical Academy of Sciences) in Kraków. 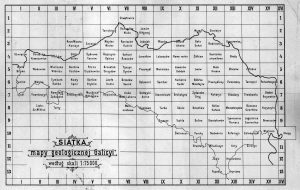 Overseen by Alojzy Alth and Franciszek Bieniasz, with later development by Marian Łomnicki, the Galician atlas comprised 106 separate maps published in 25 volumes; the maps were accompanied by a text of over 1000 pages issued in several editions. The imperial geologists took their work very seriously, indeed. 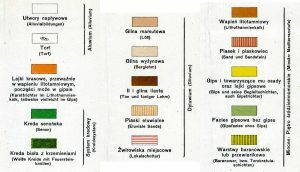 Soil symbols and colors for the map. Source: WIG map archive. Rohatyn’s map at grid location XII.7 was published in volume 22 part 2, one of the last to be completed. 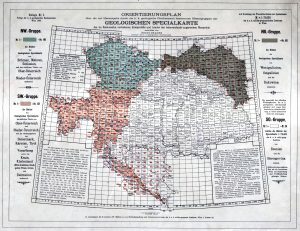 The map was created by Dr. Wawrzyniec Teisseyre (1860~1939) in 1892 and 1893, using an earlier administrative map as its base (compare, for example, the 1880 regional map). 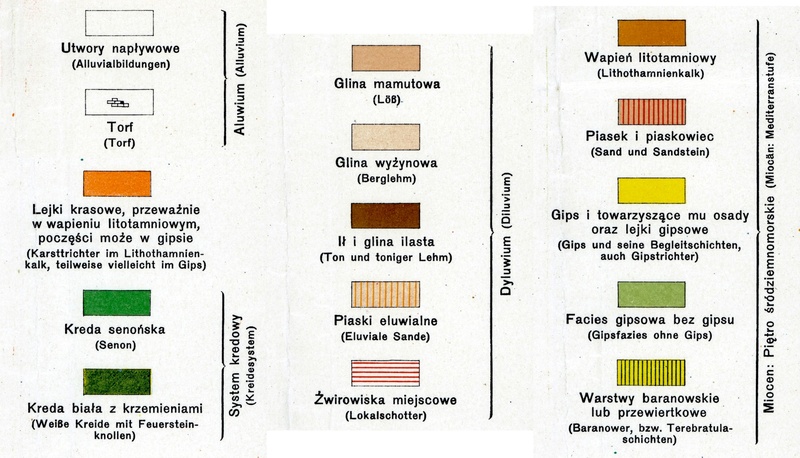 Colors indicate the various geological characteristics of the soil across the region, described in a legend in both Polish and German languages. Printing was by the Jagiellonian University in Kraków. According to the map, the city of Rohatyn sits on a large shelf of wind-deposited sediment, primarily loess, with lesser amounts of highland clay. The Hnyla Lypa river and the Potok creek cross through town, running in alluvial beds of sand and silt. Scattered around the city are pockets and funnels of gypsum sediments and chalk. In the accompanying text, Rohatyn is mentioned only a few times, because its geology is common to the Opollian upland region. The geological survey results are presented here in an overlay on Bing Maps satellite data from the contemporary town. The image is interactive: pan and zoom are available with ordinary mouse controls or gestures, depending on the device, and zoom is also available by the +/- buttons in the upper left of the display. The map can be made transparent in 10 steps by sliding the control in the upper right of the image. This 1893 geological map is one of a series of historical map overlays included in the project Mapping Rohatyn: Geography as an Education Resource.